One of the properties of atoms and molecules is that they interact with light in an interesting way. If you heat up atoms or molecules in a gas, they will give off light. But they only give off light at specific wavelengths (colors). The particular colors they emit depends on the type of atom or molecule it is. So one type of atom might give off red, orange and blue, while another might give off yellow and green. 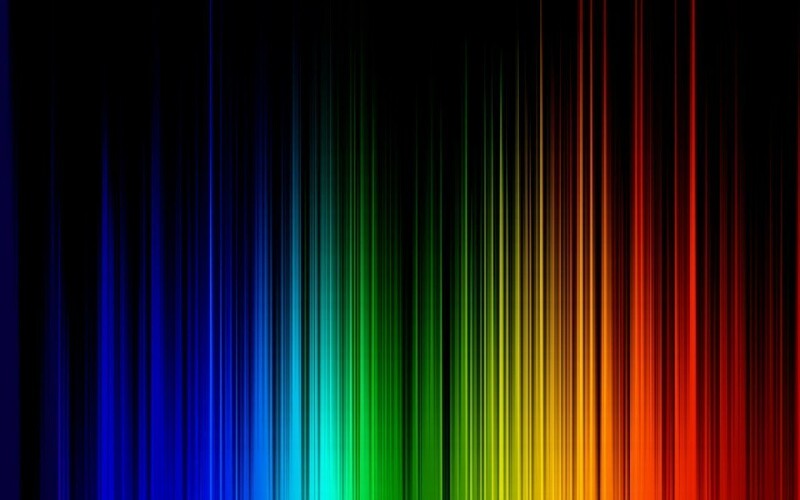 We can look at the full range of colors a particular atom emits, which is known as an emission spectrum. You can see an example of such a spectrum in the figure below. If you put a cool gas in front of a light source you get what’s known as an absorption spectrum. Basically this looks like a full rainbow of colors with dark lines at particular wavelengths where the gas absorbs that color. The colors a cool gas absorbs are the same colors a hot gas emits. Each type of atom or molecule has a specific emission spectrum. It’s kind of a chemical fingerprint that allows us to identify the type of atom or molecule makes it. That is particularly useful in astronomy, because when we observe a particular pattern in starlight we know a particular atom or molecule is in the star’s atmosphere. The spectra are also affected by things like temperature and magnetic fields, so we can learn lots of things about a star by looking at its spectra. The closest star to us is our Sun, so we can make very detailed observations of its spectra. One of the tales these spectra tell is a bit of a mystery. The Sun’s atmosphere can be divided into the photosphere, chromosphere, and corona. The photosphere is the layer where light is emitted from the sun. Within the photosphere we see an absorption spectrum This makes sense because we would expect the atmosphere of the Sun to get cooler at higher levels. The absorption spectrum means the upper layer of the photosphere is cooler than the lower layer. 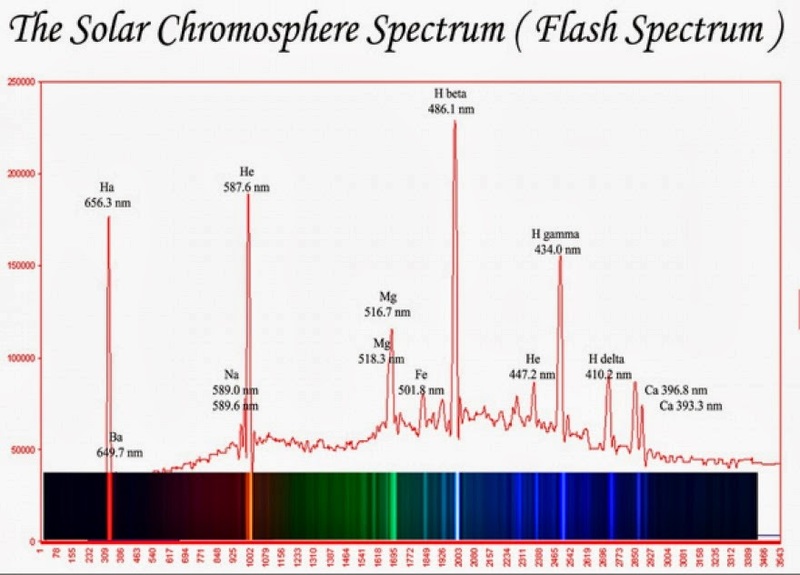 One would expect the chromosphere to be cooler still, but within the chromosphere we see emission spectra. This means the chromosphere is actually hotter than the photosphere. At its lowest region the chromosphere is about 4,500 K, but at its upper region it is about 25,000 K. The corona is very diffuse, but its temperature is even higher, on the order of a few million Kelvin. So what’s going on? Why is the upper region of the Sun’s atmosphere so much hotter than the lower region? We aren’t entirely sure, but we have a few ideas. A driving factor is that the solar atmosphere is a plasma. This means it interacts strongly with magnetic fields. The magnetic field lines of the Sun can be twisted by the motion of the plasma up to a point, but eventually snaps back into place, releasing energy. (I wrote about this in a post earlier this week). Another factor is that the chromosphere is very active with solar flares, prominences, etc., and the energy from these tends to heat the chromosphere. What we aren’t entirely sure of is what mechanism causes the corona to become so extraordinarily hot. Plasma physics is complex, and we’re still figuring it out. Is it only visible light that is given off by atoms and molecules? I was wondering if any other spectrum is affected when heat is applied. Also, as a follow up, if you added some other type of energy other than heat, would you get any new insights from a different spectrum of light. Thanks.